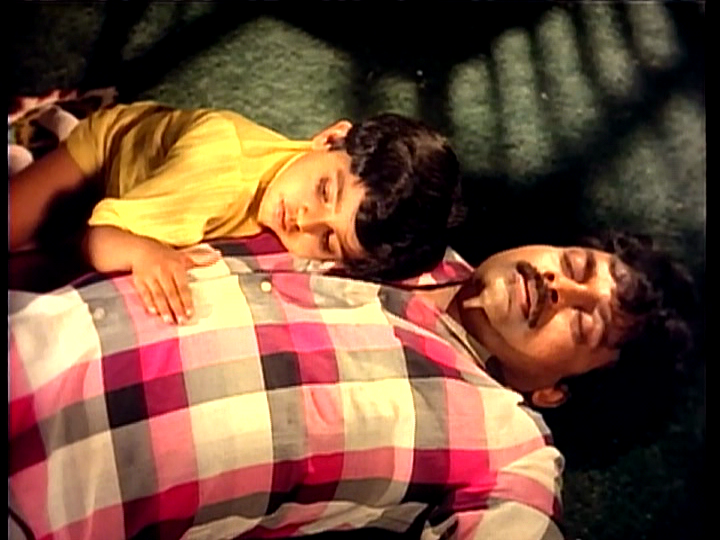 I watched Pasivadi Pranam with high expectations since Kodandarami Reddy directed many of Chiranjeevi’s best films including my favourites Challenge and Attaku Yamudu Ammayiki Mogudu, while story writer Fazil was also responsible for the excellent Manichitrathazhu. 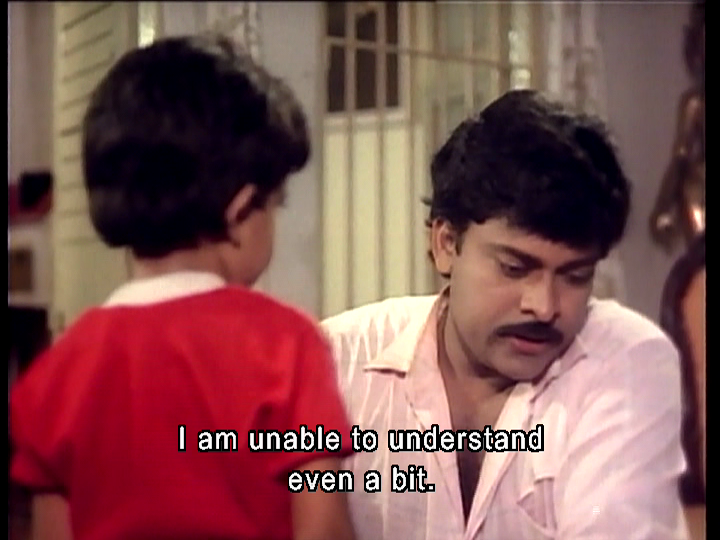 The film is a remake of Poovinnu Puthiya Poonthennal with Mamootty but as I haven’t been able to track down a copy of the original Malayalam film, it seems quite reasonable to settle in with Chiranjeevi and Vijayashanti instead. 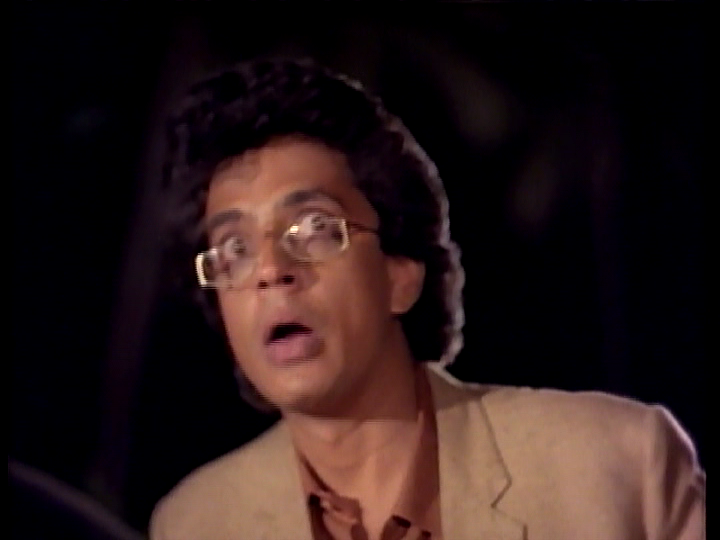 And well worth it too – with Raghuvaran as the villain and with plenty of good songs including a breakdance (below!) Pasivadi Pranam is a great way to celebrate Megabirthday 2015. 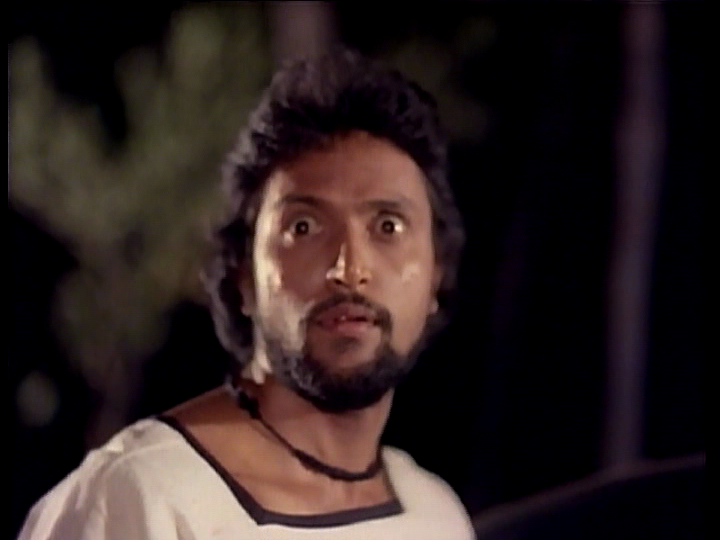 The story starts with a rather horrific murder, witnessed by the victim’s wife and young child as Sundaran (Prasad Babu) is stabbed by Ranjit (Babu Antony) under the direction of his boss Chakravarty (Raghuvaran). 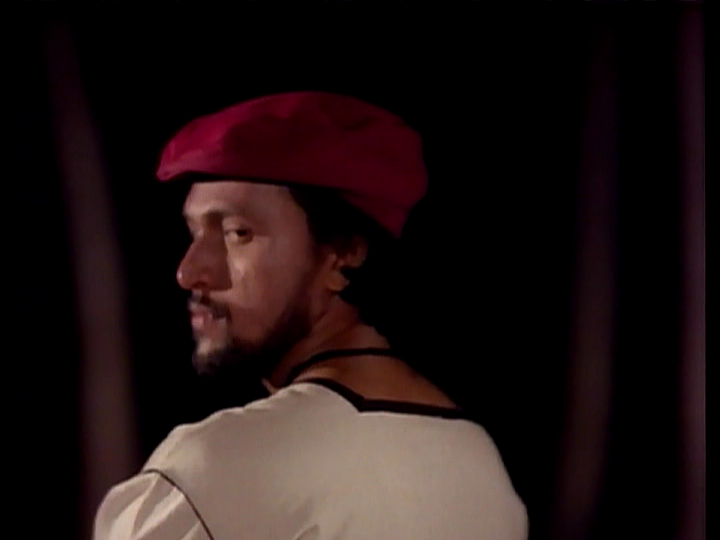 Intriguingly Ranjit is dressed entirely in white – surely not the best colour to wear when preparing to stab someone, and then rather randomly he pulls on a red hat before carefully removing it a few moments later when he attacks Sundaran. One of those delightfully random moments that I wish had some deeper meaning – but doesn’t! Despite murdering Sundaran almost right outside his front door, Ranjit and Chakravarthy are shocked and appalled to realise their crime has been seen and Charavarty sends Ranjit to get rid of the two witnesses; Sundaran’s wife Lakshmi (Rajyalakshmi) and their son (Baby Sujitha). Although Ranjit manages to kill Lakshmi, her son has a better developed survival sense and manages to escape. Initially he does quite well, hopping on a bus and heading far away from the chase, but eventually he falls asleep at the side of the road. 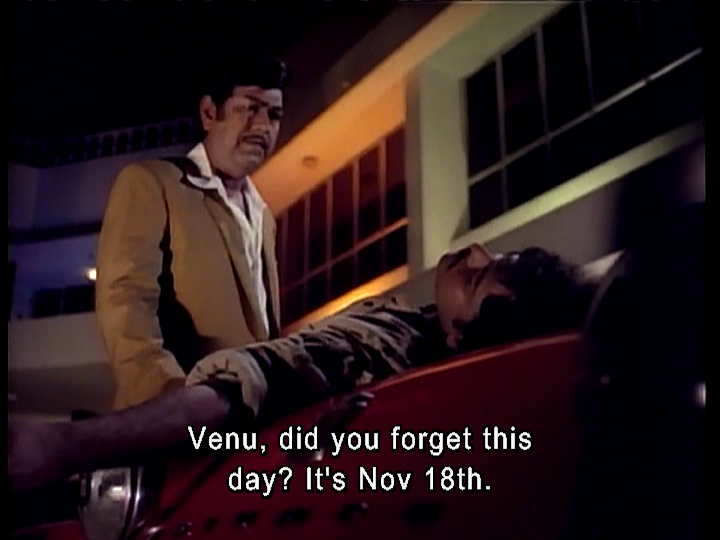 And that’s where drunken bar owner Madhu (Chiranjeevi) finds him later. Madhu apparently has a death wish – illustrated by a fight in the bar he owns and perhaps rather more riskily by gate-crashing an exercise class and joining in with the ladies in leotards. 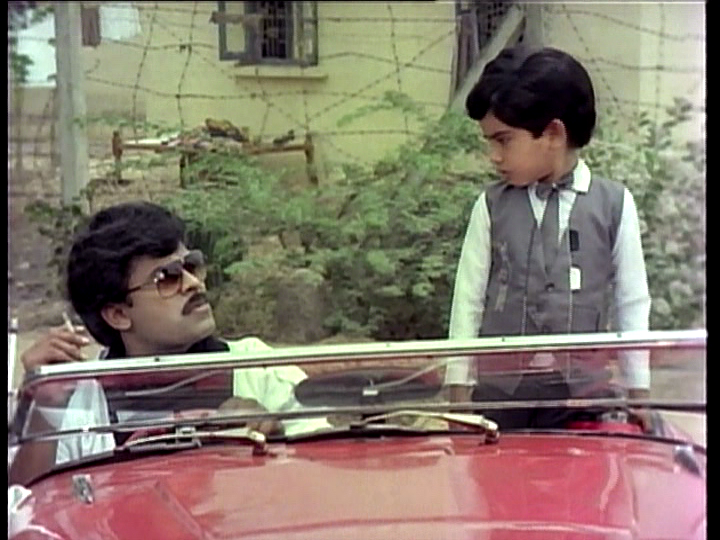 Despite his attempts to commit suicide by aerobicise, Madhu has a kind heart and he stops his car when he sees the small boy asleep at the side of the road. 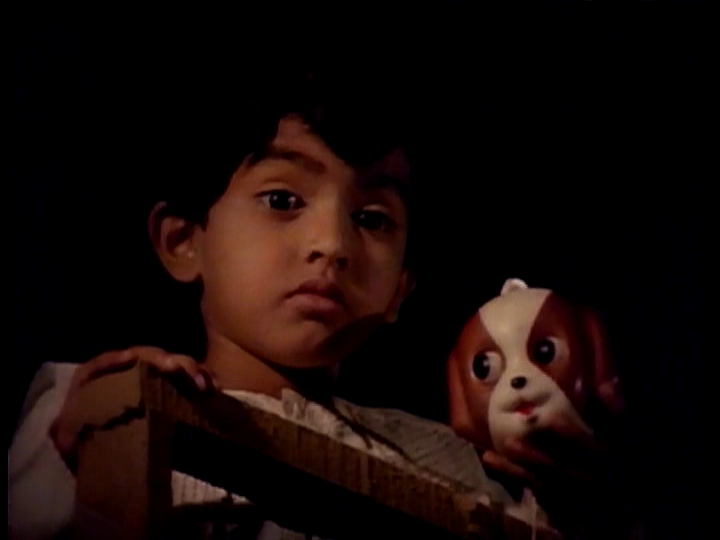 After a half-hearted attempt to locate the boy’s parents fails, Madhu decides to take the child home with him and call him Raja. The next day however he discovers that Raja has been born deaf and consequently is also dumb; reasons which the consulting doctor suggests may have been the reason for Raja’s abandonment by the side of the road. Madhu isn’t convinced though since Raja seems to be trying to tell him something, although he can’t quite work out the message. 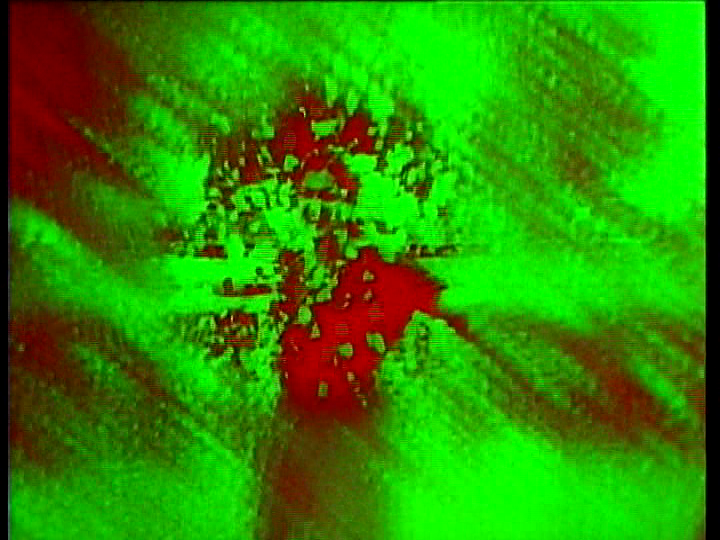 Madhu has a sad past which is explained later in the film but initially there are just cryptic references to November 18th and a psychedelic green and red image of a spinning woman that appears onscreen. 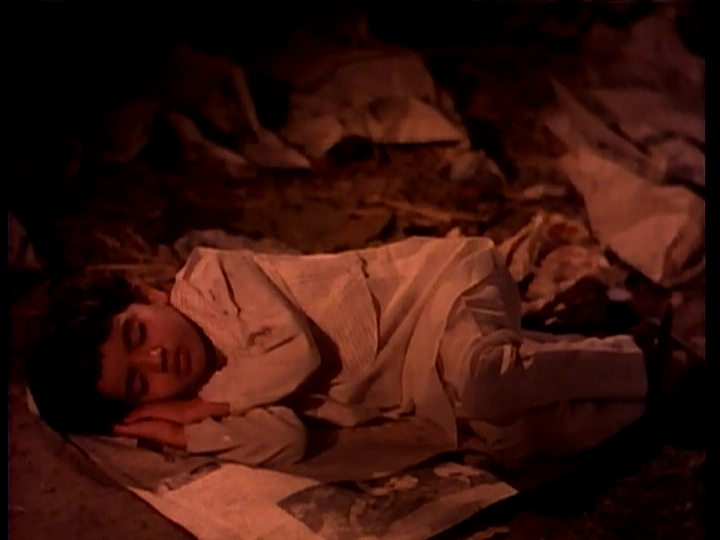 A flashback sequence explains that Madhu’s wife Lakshmi (Sumalatha) was killed on their wedding day, and after that tragic event Madhu has turned to drinking himself into oblivion most nights. He tells himself not to get too close to Raja, but seems to immediately forget this instruction and starts treating the boy as if he was his own son. 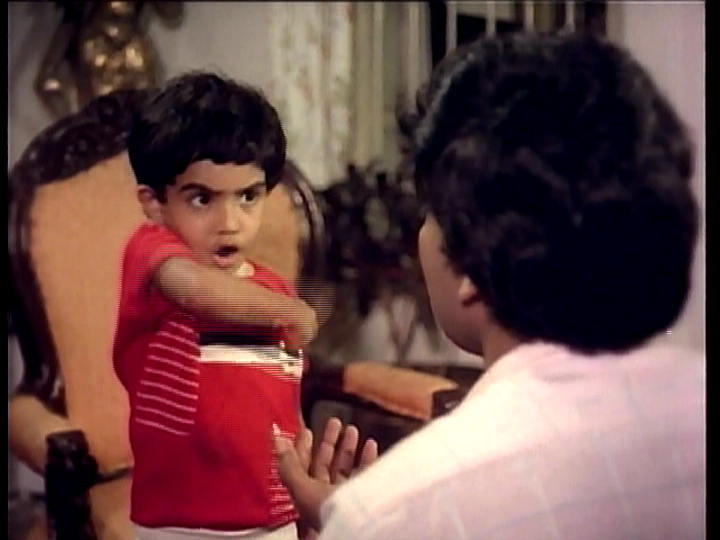 Sujitha is very cute as Raja and is also great at remembering the character isn’t supposed to be able to talk. It’s an impressive performance from the young actor and she has an excellent rapport with Chiranjeevi throughout the film. 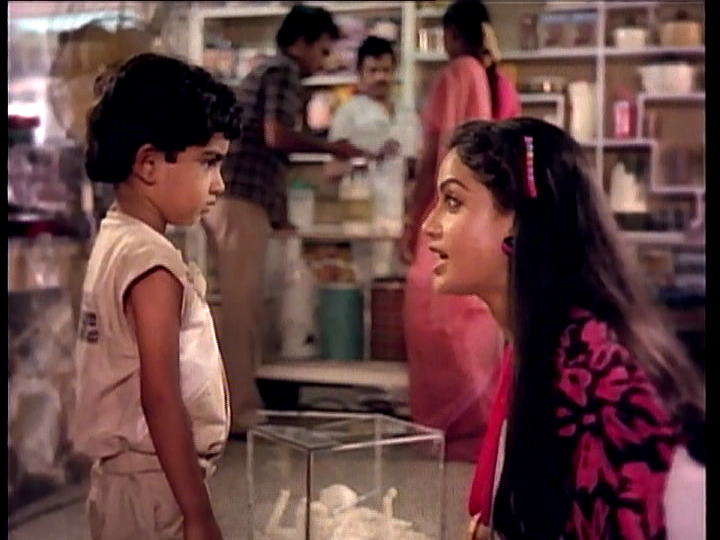 While out buying toys for Raja, Madhu meets Geeta (Vijayashanti), and after the initial altercation when Raja breaks a model Taj Mahal, Geeta seems quite taken with the pair. She starts stalking Madhu, turning up at his house and inviting him round to visit. Much of the comedy is based on Geeta’s pursuit of Madhu and his rather ineffectual attempts to rebut her advances until he rather dramatically announces that he is a ‘married bachelor’. 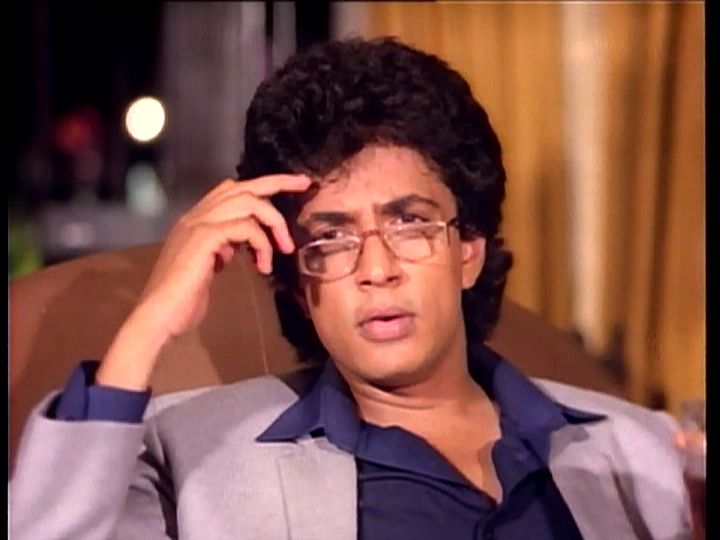 At the same time as the romance is going on, Ranjit is still trying to follow Chakravarthy’s commands and get rid of Raja. However he misses numerous opportunities and is eventually soundly beaten by Madhu once Raja wakes him from his drunken stupor. 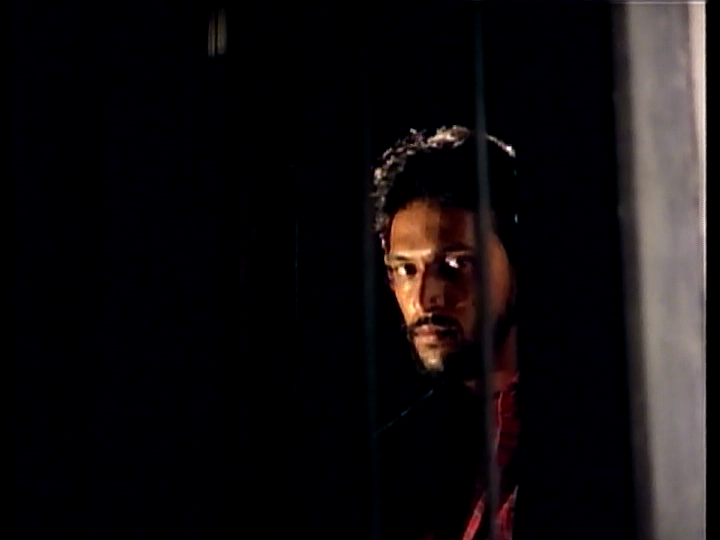 This turns out to be the last straw and Madhu renounces the demon drink so that he can take proper care of Raja. The attempts on Raja’s life clue Madhu in that there is more going on than just an abandoned child and he starts trying to piece together Raja’s past. At the same time, Geeta’s father decides to reconcile with his estranged daughter (you guessed it) Lakshmi and finds her mysteriously missing. This in turn gets the police involved and after various mix-ups and tense moments, finally Madhu discovers the truth. Although Pasivadi Pranam is a fairly straight forward story, there is a good mix of drama, suspense and comedy which all add up to a cracking good tale. Fazil knows how to keep an audience glued to the screen and even the interjection of songs and some comedy with Vijayashanti’s character doesn’t derail the tension. 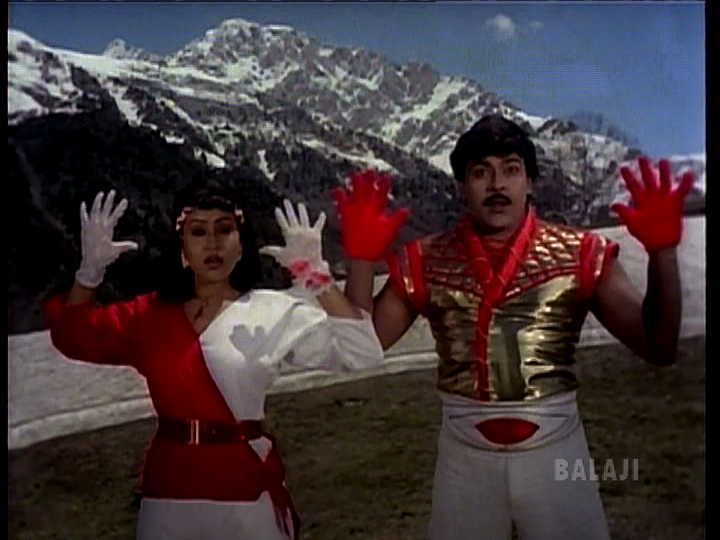 The songs are fun with the occasional odd fashion choice (gloves and a sari?) but I do appreciate the sensible footwear for snowy conditions. I love the backing dancers outfits in this song too – they turn from dull and drab to a glorious blue so simply and the effect is marvellous. 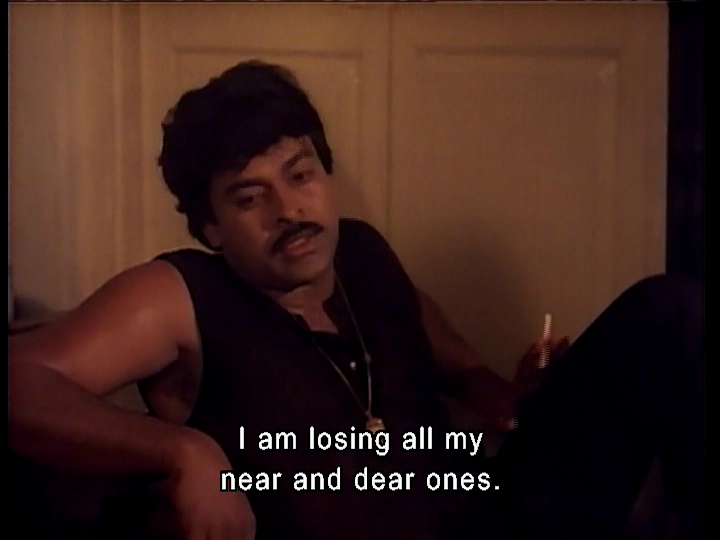 Chiranjeevi is excellent as a lonely man, ridden by guilt who wants nothing more than to be left alone to wallow in his misery. His gradual transformation at the hands of a small boy is beautifully done and the addition of a love interest in Geetha helps add some light hearted fun and stops the story from being too dark. Vijayashanti has plenty of infectious energy and I get the feeling she enjoyed turning the tables on Chiru, being the stalker rather than the stalkee for a change. The two have wonderful chemistry together and their comedy scenes also work well, although Raja steals the show when he does an impersonation of Geeta which is simply perfect! The villains of the piece are also better realised than usual and are suitably creepy rather than all out vicious thugs, while Babu Antony is genuinely sinister as he skulks along in the shadows. 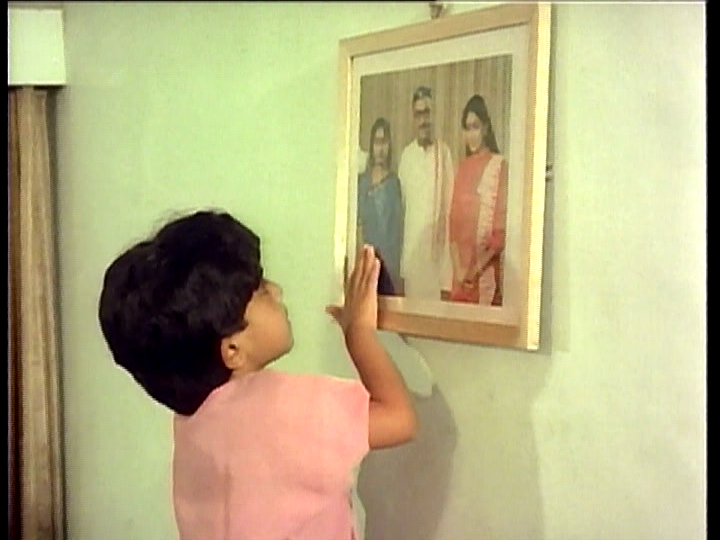 Pasivadi Pranam illustrates just how good a film can be when it starts off with a proper (and good) storyline. Add excellent performances, appropriate dialogue and generally well placed songs and it all adds up to an entertaining film that’s well worth a watch. 4 stars. 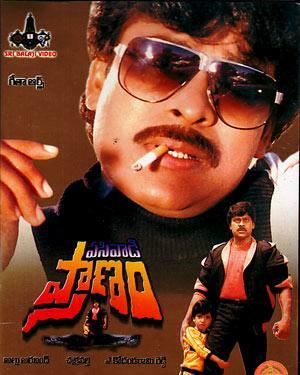 This entry was posted in Tollywood and tagged A. Kodandarami Reddy, Babu Antony, Baby Sujitha, Chiranjeevi, Fazil, megabirthday 2015, Prasad Babu, Raghuvaran, Rajyalakshmi, Sumalatha, Vijayashanti. Bookmark the permalink. Thanks – Awesome! I forget about Youtube as I do prefer to watch movies on DVD, but this is great!